When I think of bronze outdoor lighting fixtures, immediately I think of those beautifully sculptured ancient Greek bronze statues recovered from ancient sunken ships. How in the world did these ancient sculptures sitting at the bottom of the ocean for hundreds of years stand up to all this abuse? It might have something to do with the bronze used in creating them. Bronze is an alloy metal, meaning that it is created by a process of fusing two or more different types of metals together. This results in the creation of a new metal that gains the properties of the fused metals. Bronze is primarily made up of two metals. The base is made of copper and the rest is usually tin. This combination sometimes will be combined with other elements such as phosphorus, manganese, aluminum or silicone. Selecting the best bronze for your outdoor lighting fixtures is the only way to ensure that it'll stand up to the test of time. Aluminum bronzes are known for their strength and high corrosion resistance. They are an excellent choice for any outdoor lighting fixtures that will be exposed to the outdoor environment at all times. Choosing a fixture that fits your vision of what you want for your outdoor lighting setup is key to your decision. If your looking at enhancing your existing environment, find something about it that inspires you and build upon that. Maybe you love the antique look of your beautifully decorated wrought iron fence. It may give your outdoors that old time charm that is missing so much now a days. Use your imagination and play into that theme. Choose bronze antique outdoor lighting fixtures to bring out the beauty and character of the wrought iron fence even more. Let your creative juices flow and you'll love your space. If you're building something fresh and new, you'll have a ton of options. Use your outdoor lighting design to incorporate bronze outdoor lighting into your outdoor decor. Finding the perfect bronze outdoor lighting fixtures can be done in the comfort of your own home. Let your fingers do the walking and click away. 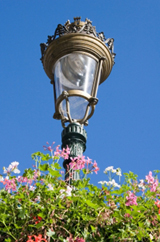 The internet has a lot of resources to find your next outdoor lighting fixtures. Find ones that you like and rate them. Its best to stay within the same family of fixtures for easy color matching. Its also good to stay within the same family of fixtures so you can be fairly certain that the style and quality of your bronze fixtures is of the same grade. Once you find the bronze fixtures that you like, check with the manufacturer to find out what type of bronze alloy they use. Remember, earlier we said that aluminum bronze is best for outdoor lighting fixtures. Since these fixtures will be outdoors, you'll want to make sure they're durable. Similar to copper outdoor lighting, manufacturers will place a clear coat of lacquer on the finished bronze to prevent it from tarnishing right away. This lacquer will eventually wear off exposing the bronze and begining the tarnishing process. Often the tarnished bronze adds to the antique look of the bronze fixture, giving it an elegant look and blending it into the surrounding decor. If your at all torn between one fixture or another, remember that quality bronze outdoor lighting will be there for years to come so go with the ones that you like best. Try not to settle for lower quality bronze because you'll find yourself having to replace them later on. Who knows, later on you might not find comperable bronze fixtures that fit just right into your outdoor environment. Thats why making the right choice the first time is so important.